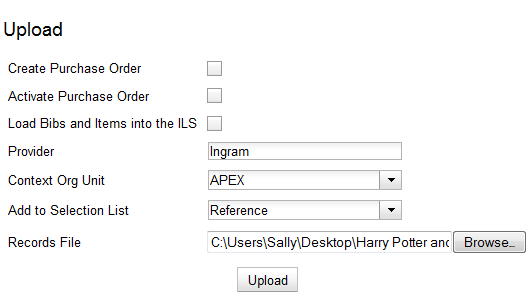 The Load MARC Order Records screen enables you to upload MARC records that have been saved on your computer into the ILS. You can add the records to a selection list and/or to a purchase order. You can both create and activate purchase orders in one step from this interface. Also, from this interface, you can load bibs and items into the catalog. If you want to upload the MARC records to a new purchase order, then click the check box adjacent to Create Purchase Order. If you want to activate the purchase order at the time of creation, then click the check box adjacent to Activate Purchase Order. If you want to load bibs and items into the catalog, then click the check box adjacent to Load Bibs and Items into the ILS. Enter the name of the Provider. The text will auto-complete. Select an org unit from the drop down menu. The context org unit is the org unit that owns the bib record. You should select a physical location rather than a political or administrative org unit as the context org unit. For example, the Smith County Library System is funding purchase of a copy of Gone with the Wind. The system owns the bib record, but it cannot receive the physical item. The acquisitions librarian will choose a physical branch of that system, a processing center or an individual branch, to receive the item. If you want to upload the records to a selection list, you can select a list from the drop down menu, or type in the name of the selection list that you want to create. Click Browse to search for the file of bibliographic records. A summary of the items that have been processed will appear. Click the links that appear to view the purchase order or the selection list.